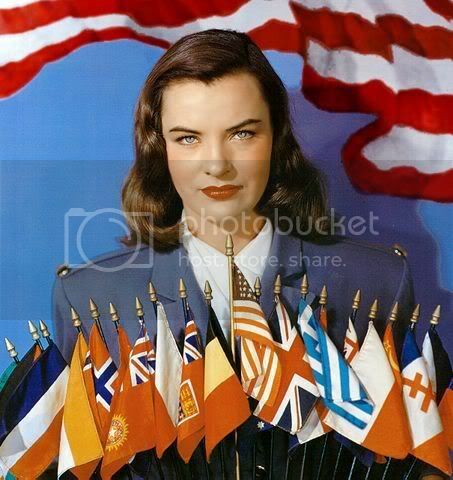 Mongo, hope that sometime you can do something on Ella Raines and Edmond O'Brien. 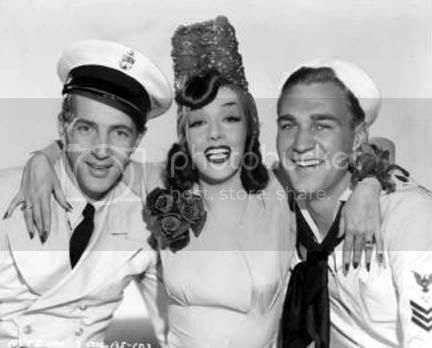 Thanks, Mongo, for answering my request and starting my day out so great with a wonderful pic of Ella Raines. Moira, the "Matt Houston" TV episode with Miss Raines is "Death Match" from February 24, 1984. She had a cameo role on the show as the character Dorothy. Director Robert Siodmak was very fond of Ella Raines and saw the potential in the lovely actress. She made 4 films with him. Vallo and Filmmaker, thanks for your continued interest in the thread. I appreciate it. Judith, there are a few suggestions on your list that I have planned for future spotlights. You would not believe the length of the list that I have pending. 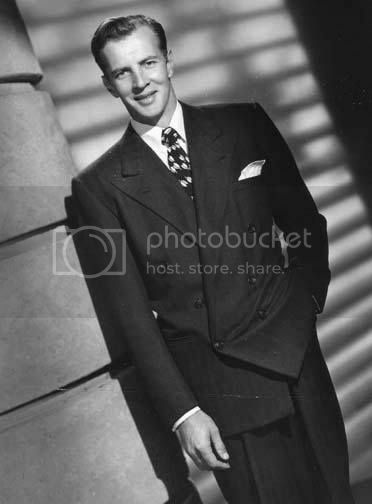 Tall, appealing and good-looking actor born Herman Brix on May 19, 1906 in Tacoma, Washington. Herman Brix's first career was as an athlete, and he won the Silver medal for shot-putting in the 1928 Olympic Games. Eventually, he was picked by Ashton Dearholt of Burroughs-Tarzan Enterprises Inc. to star in the 1935 movie serial, "The New Adventures of Tarzan" following in the footsteps of fellow Olympic stars Johnny Weissmuller and Buster Crabbe. Brix was set to take over the role years earlier in 1932 at MGM but was injured and replaced by Weissmuller. Brix's Tarzan, produced by Burroughs' own company, spoke in a cultured voice with a full English vocabulary, as in the books, and the films were shot in the jungles of Guatemala rather than on a Hollywood backlot; Burroughs detested the MGM version. After a number of serials and B-movies, and finding himself still typecast as "Tarzan" in the minds of major producers, Brix changed his name to "Bruce Bennett" following time in service during World War II. He appeared in many top-notch films in the 1940s and early 1950s including "Sahara" (1943), "Mildred Pierce" (1945), "Nora Prentiss "(1947), "Dark Passage" (1947), "The Treasure of the Sierra Madre" (1948), "Mystery Street" (good noir) (1950) and "Sudden Fear" (1952). Other films included "Escape to Glory", "The More the Merrier", "A Stolen Life", "The Man I Love", "Silver River", "Task Force", "Dream Wife", etc. However, he was always in the shadow of Gary Cooper, and often got inferior Cooper-type roles. From the mid-1950s on he mainly appeared in lesser films, such as "The Alligator People" (1959), and on television in guest star roles. He was a very successful business man during the 60s becoming sales manager of a multimillion dollar vending machine company. Bennett reached his 100th birthday on May 19, 2006. Bruce Bennett was married for 67 years and has 2 children. Standard works of reference such as Halliwell's "Who's Who in the Movies" and Katz's "Encyclopedia of Film" give his date of birth as 1909 (or 19th May 1909) but IMDB has 1906, and this date is confirmed by the 1920 and 1930 U.S. Census records. The actor does not have a star on the Hollywood Walk of Fame. Nice work, Mongo--Bennett is one of my favorites, especially the serials and b films he made. Oddly enough, I watched 2 of his films last night--SABOTAGE SQUAD from 1942 and THE SECRET SEVEN from 1940--both Columbia's I found on ebay. The latter was particularly good as an early example of the use of forensics in fight crime. Bennett was and is an amazing man. By the way Mongo--Brix changed his name in 1940. After his Republic serials, he left films and took up acting classes due to his frustration at being typecast. It was Columbia that signed him as Bennett in 1940. Thanks again for the post. I always like his soft spoken way of acting. I can't believe he wrote and starred in "Fiend of Dope Island" (1961) When I looked him up a while ago on IMDb. One comment was: Bruce Bennett Is Mad as Hell - and They Are Not Going to Take It Any More! I hope TCM finds and shows this film. It could be interesting.. I like the off kilter photo that you chose of Bruce Bennett. He looks so nice...and uneasy! I'm reminded of one of my favorite passages from A.M. Sperber and Eric Lax's biography of Humphrey Bogart, in which the authors interviewed Mr. and Mrs. Bennett about their memories of the icon during the making of the good war movie, Sahara (1943). Lonely and restless, Bogie found the Bennett's sympathetic souls in their isolated desert location, and spent many evenings with them being...normal! After many such nights, Bogart finally blurted out to the two of them that they ought to get "out of show business", because they were "too nice". Fortunately for Joan, Ann and Ida in Mildred Pierce, Nora Prentiss, and The Man I Love, BB hung in there, delivering solidly understated performances, (though some, more critical of our friend, would say wooden), and keeping the flame of "niceness" aglow in the noir era, despite himself. That sounds like an interesting sleeper that you've come across. Bruce Bennett mad as hell? Well, maybe cranky and irritable at times when Joan Crawford got on his case or Rosemary DeCamp wanted him to get home on time for dinner, but true rage? This I gotta see. Blackhangman, glad that you appreciated the profile of Bruce Bennett. Perhaps we will be lucky enough to catch some of those early Columbia 'B' films on TCM. I hope so. I have most of them already, but it would be nice to replace them with off the air copies. But, alas, I'm not going to hold my breath. Don't think I'll be seeing U-BOAT PRISONER on TCM in the very near future!! Vallo, It looks like Bruce Bennett went the route of other aging actors into the realm of schlock. An excerpt of a review from "Fiend of Dope Island" indicates "Bennett is one crazy, funny, weird and depraved guy to make a film like this. As bad and hammy as he is, he makes this film immensely entertaining barking out commands and cracking a whip or just laughing maniacally". His next to last film was titled "The Clones". As always another great spot light Mongol!I can never understand how some these actors and actresses' never got a star and some of them Like Trump do.I like his small performance in Mildred Pierce sometimes the actors who do the bit or supporting roles out shine the leading stars. Moira, nice story about Bogart and the Bennetts'. Looks like a happy 67 year marriage did the trick for the 100 year old actor. I have yet to see "Sahara" and will make it a point to do so when it airs again on TCM. The movie was up for 3 Oscar nominations including one for J. Carroll Naish (best supporting actor). Once again you've come up with a winner---I knew nothing about this actor, and now I'm eager to find those Tarzan movies he did---I never realized Burroughs himself was behind any of them. Are they on dvd, anyone? Your article comes as kind of a "coinkydink" since a friend of mine and I were just discussing the upcoming 101st birthday of another actor, Charles Lane (Jan. 26th). 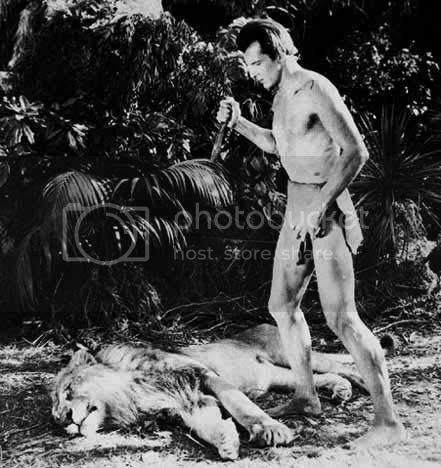 The one performance of Herman Brix as Tarzan was in the 1935 serial NEW ADVENTURES OF TARZAN. The serial was shot in such a way as to cull two different "movies" out of it--NEW ADVENTURES OF TARZAN and TARZAN AND THE GREEN GODESS. The first chapter of the serial is unusually long (about 40-45 minutes) and makes up the brunt of each theatrical movie, with different pieces of the serial padding out the rest of each film. If you want to see it as originally filmed, get the serial. It's available on a number of sites including www.serialsquadron.com. Thanks very much for that info!! Yippee! I've edited this to announce I found it on Netflix and it's in my "queue". The serial, The New Adventures of Tarzan, is a public domain title. One source is the Alpha Video DVD, the entire serial for around $5.99 (www.oldies.com). I have also noticed it in places like Fry's for $4.99. > have also noticed it in places like Fry's for $4.99. Thanks very much. I look forward to seeing it. Katy Jurado born on January 16, 1924 was a Mexican actress in a number of American films. Born Mar?a Cristina Estela Marcela Jurado Garc?a to a wealthy family in Guadalajara, Jalisco, she started her career in Hollywood and moved back to continue filming in Mexico. Her role in the Mexican movie "Nosotros Los Pobres" opposite the well-known Mexican actor Pedro Infante brought her fame. She would eventually win 3 Ariel Awards, Mexico's top acting honors. She subsequently appeared in many Hollywood movies including "The Bullfighter and the Lady", "High Noon" (earning a Golden Globe for Best Supporting Actress), "Arrowhead", "Broken Lance" as Spencer Tracy's Indian wife (for which she received an Academy Award nomination), "The Racers", "Trial", "Trapeze", "The Badlanders", "One Eyed Jacks" opposite Brando, "Barabbas", "Stay Away, Joe" (opposite Elvis Presley) for which she gained 22 pounds in 22 days to play the part of Annie Lightcloud in "Stay Away, Joe". Days before filming she broke her foot and removed the cast prematurely which explains her limp throught the movie. Also in "Pat Garrett and Billy the Kid", "The Children of Sanchez", "Under the Volcano" and "The Hi-Lo Country". Her last film performance was in the Mexican film "Un Secreto de Esperanza" (2002). She also co-stared on TV in episodes of "The Rifleman" with Chuck Conners, "Playhouse 90", "Climax! ", "The Virginian", "Baretta", etc. Jurado was married twice, first to Mexican actor Victor Velazquez with whom she had two children and secondly to actor Ernest Borgnine 1959-1963. He referred to her as "beautiful, but a tiger." She died of kidney failure and pulmonary disease in 2002, at the age of 78 in Cuernavaca, Morelos, Mexico and was survived by a daughter. She is one of only two Mexican actresses to have been nominated for an Academy Award. Salma Hayek recently shared the same honor. Miss Jurado has a star on the Hollywood Walk of Fame.